Greens your lawn in 24 hours and gives your lawn a quick boost of nitrogen while controlling weeds. 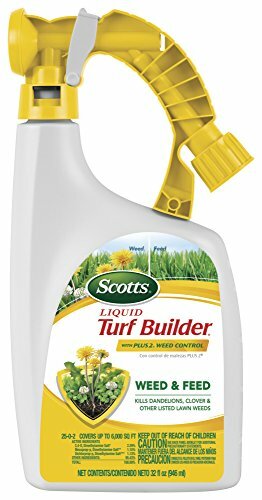 Kills dandelions, clover and other listed lawn weeds. Easy to use. Spray when weeds are actively growing. Size: 1 Qt Fertilizer Analysis: 25-0-2 Ready-to-spray P-Free formula Gives your lawn a quick boost of nitrogen while controlling weeds kills dandelions, clover & other major lawn weeds Easy to use Just attach hose & spray. How to Use Easy to use! Just attach hose and spray When to Apply Spray when weeds are actively growing. Where to Use Use on bluegrass, fescue, ryegrass, bahiagrass, common bermudagrass, centipedegrass, and zoysiagrass. Where Not to Use For grass lawns. Do not spray St. Augustinegrass, Buffalograss, dichondra, lipid or desirable clovers. Do not use this product on flower or vegetable beds or around shrubs, trees or ornamental plantings. The maximum number of broadcast applications per treatment site is 2 per year.